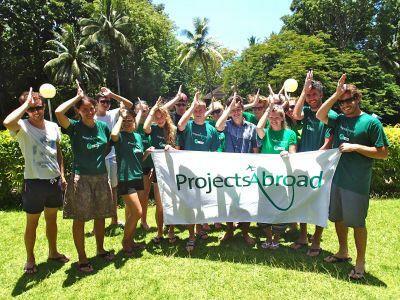 Projects Abroad’s Shark Conservation Project has begun in Fiji with 26 volunteers confirmed for the month of January 2014. Currently, 13 volunteers have already begun their dive lessons with Beqa Adventures dive instructors. Beqa Adventures is responsible for teaching the volunteers how to dive and guiding them through the whole process of shark tagging. The Shark Conservation Project in Fiji forms part of Projects Abroad’s Global Shark Campaign , which gives people from various backgrounds and ages the chance to help with the conservation of sharks and marine life. Projects Abroad are embarking on a campaign in 18 countries across four continents to raise awareness on shark conservation. The volunteers are particularly focused on their mission to add to the knowledge base of shark movements and to increase numbers through mangrove conservation. French volunteer Vinciance Leloutre feels excited about the whole program, “I’m actually an advanced diver so I’ve been shark diving before and I absolutely love it. This is my passion,” she said. Marine Biologist and Field Coordinator Erik Lindstrom ensure that volunteers are well trained in diving and have completed their assignments and presentations beforehand. Project Manager Andy Hill is ensuring that all incoming volunteers are prepared for their schedule the next day. Country Director Ingrid Sprake is completely hands-on with the project and is responsible for training each volunteer in the Shark Conservation Diver Specialty Course before they go on a shark dive. "It’s absolutely fantastic to finally meet all the volunteers in person. The team and I are all very excited to see the results of everyone's hard work as we work towards the salvation of the sharks, “said Ingrid. It is important that volunteers are trained physically and mentally before the shark diving begins. Those who are not already certified are currently undergoing dive training. We thank the Shark Conservation volunteers for taking the time to make a difference by participating in the Global Shark Campaign .